We have been looking for koi fish for these few days. As koi one of freshwater ornamental fish, let see what other options we have in the same group of this class. As you know most of the freshwater fishes are small, with shorter lifespan that also make their prices cheaper. Anyway some of them are really beautiful and have fairly long life that will be sell at so expensive price (up to million dollars). Freshwater fish are easy to take care of compare to the saltwater fish, so here we will see some of them. 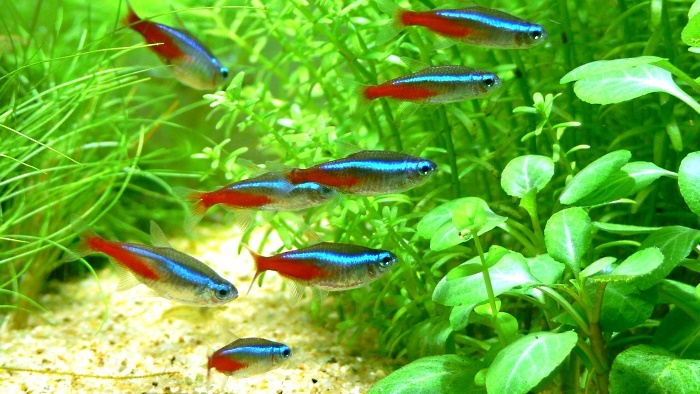 Neon Tetra is really GMO product anyway still nice to see it in your aquarium as it can glow under UV light. Produced in order to help scientist to detect water pollution, but something not working according to plans so, it was turned into aquarium fish instead. 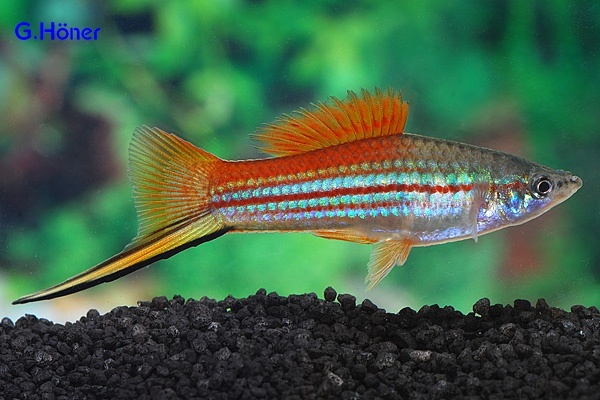 It will add something beautiful to your aquarium but we still not sure the impact of this fish if we put it back into the wild – so keep this fish safely in your tank. Sword tails is another simple fish to keep same as Tetra but still nice to see as they will swim together in the small group in your tank. They are few colour variations from sword tails too, so the right colour choice will add extra vibrant into your aquarium. As sword tails are easy to keep, it is suitable even for young beginner to start their new hobby. Fire Mouth Cichlid is another easy fish for new beginner especially when they prefer a bit bigger colourful fish. With its bright red colouration on their underneath of its body. They might be more aggressive during the breading season. So it’s either you can keep it alone or provide proper protection areas (hiding place) so they can lay their eggs peacefully. Goldfish one of the most popular fish to start with as it is easy to keep. Anyway there are still few simple rules to follow. Gold fish have beautiful colours and swim slowly in the water. Suitable for kids to start learning how to keep fish in the aquarium. 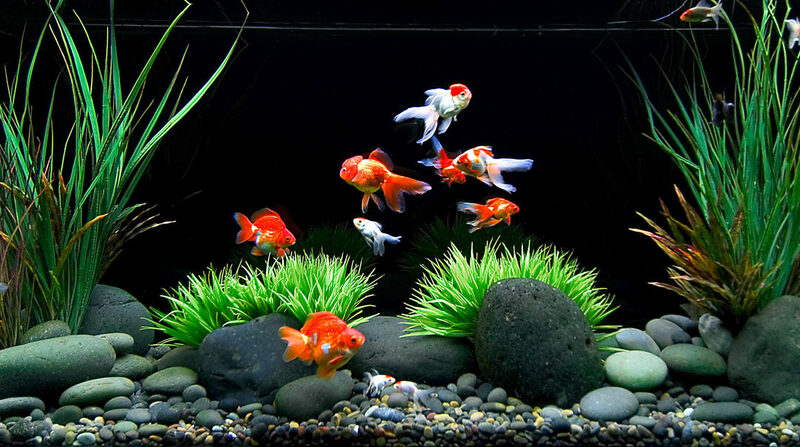 With good care, gold fish can live much longer in the aquarium. Aquarium gourami is different than the wild types gourami. 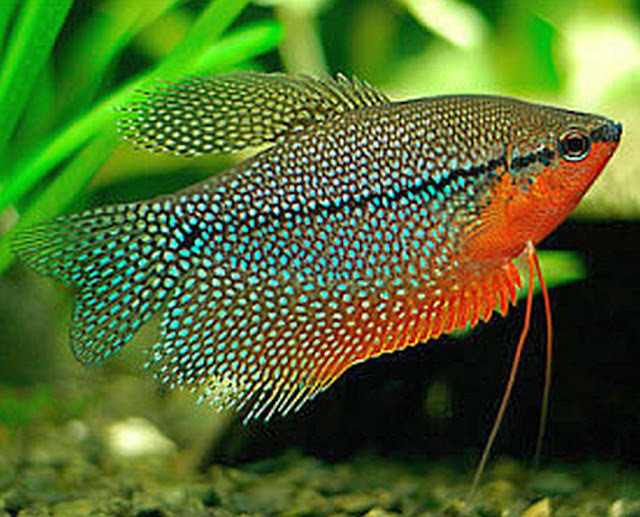 Just like any other aquarium type fishes, they are specially breed to produce wonderful colours to look more attractive. Gourami’s body is thinner but broader from the side. Gourami can achieve a bigger size and live much longer than goldfish. Gourami can be keep in small group and they have slower motion (and sometimes not move) - it will give you more time to see their details. Another beautiful freshwater fish from Amazon River. They are wide range of colours from red, yellow, green, blue, oranges, brown, and cream with different shades. They also have different types of marking make it more attractive. With all the qualities, discus become great choice if you’re looking for colourful freshwater fish. Discus is considered expensive for beginner. So make sure you have some knowledge before start to invest on this fish. 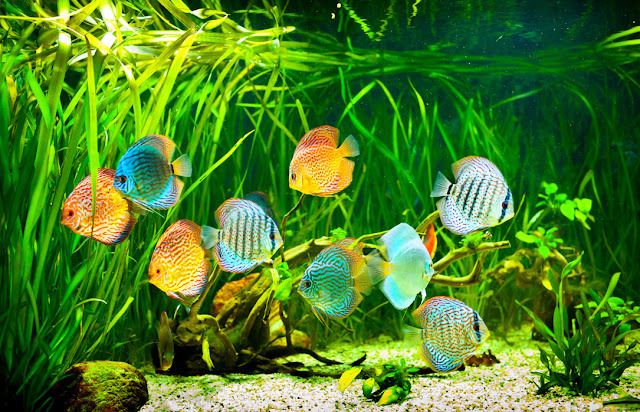 They are many types of freshwater angelfish with many colours of them. The reason to make them special than any other freshwater fish is their shape. Angle fish has triangular shapes while they also come with various colours and marking. 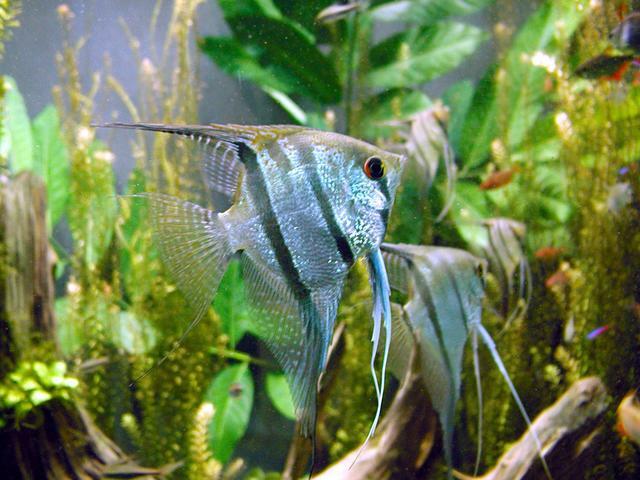 They are many types’ of triangular freshwater fish, but usually we still refer them as one group – Angelfish. 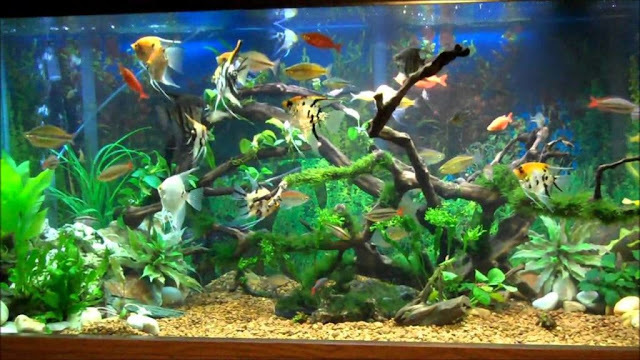 Same as other types of fish has been breed to produce more colourful species for ornamental purposes. 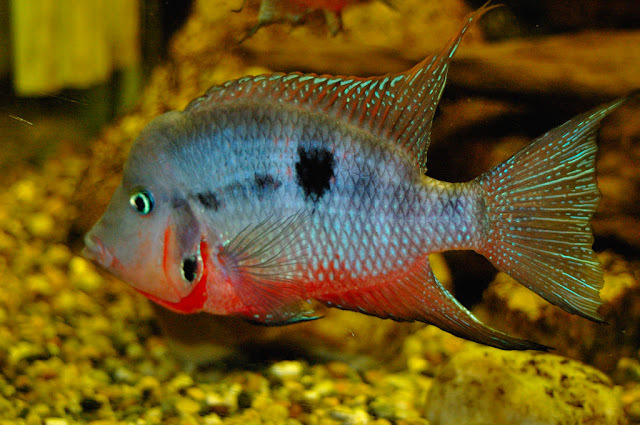 Flowerhorn Cichlid is another cichlid family produced from various crossbreeding of cichlid family. 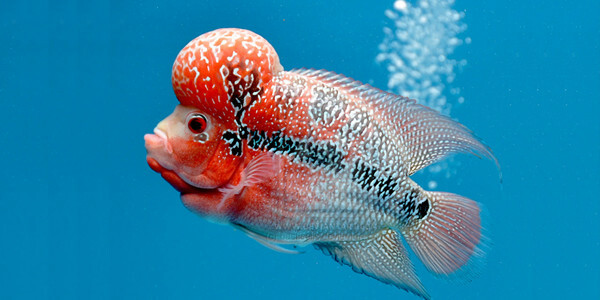 The most significant for this type of fish is the protruding head and the spots on their body. 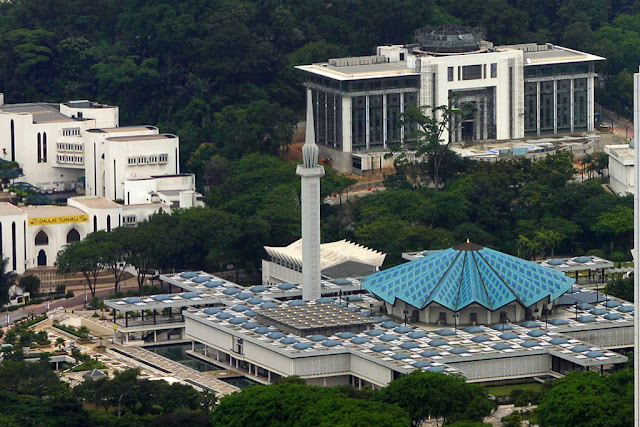 While they also have various colours, but the markings are considered more important. Most popular colour is red. While the most expensive Flowerhorn ever was sold for 600 thousand dollars during Malaysia exhibition in 2009. One of the most expensive freshwater fish other than koi. The different is, arowana is harder to keep and it’s rarely keep in open pond. 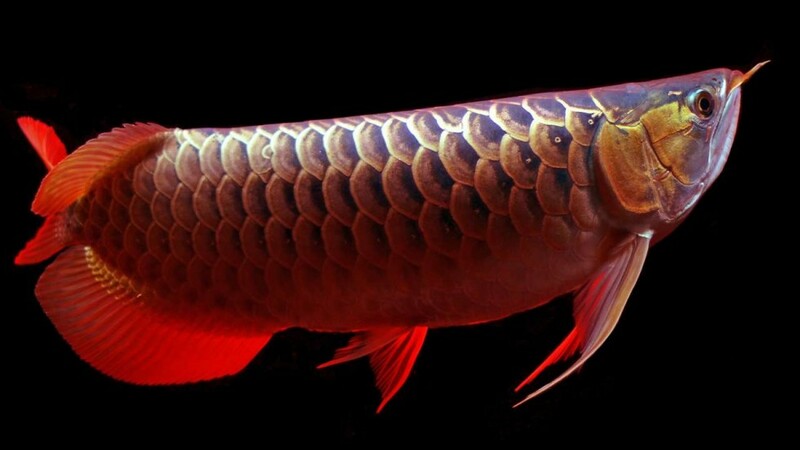 Arowana known for its beautiful larger scales even though it will only have one or few dominant colours. They are some extant species from South America, one from Africa, several from Asia, and two from Australia. Larger scales make them resemble the Chinese Dragon another reason that make it so popular among Chinese keeper. Arowana requires larger space, and rarely keep in large number in one tank. Koi is more colourful and beautiful to keep in open pond. Not like Arowana you can keep few koi in the same pond. Even though the price of koi can be expensive, most of them are at fair price when small and will be kept until they achieve bigger size. 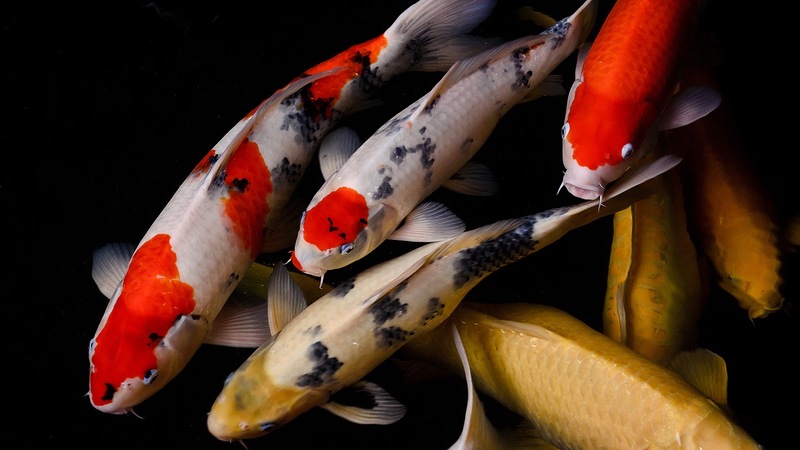 They are so many colours of koi with different types of scales, produces by koi breeders in order to get new types of koi. Koi are suitable in open pond as they are colourful when they swim together in small group. Well, the more you learn the more you know about colourful species of freshwater fish - that you can get the same result with saltwater fish, where the care will be more complicated. With proper planning and understand what you want to achieve from your hobby will help you to know which fishes are suitable with you. Anyway, you need to start with something simple to develop the knowledge and some experiences before you get more serious with expensive fishes.